Donakowski, William Jan, age 61, of El Sobrante, California passed away on October 15, 2017. Born in Flint, Michigan Bill grew up in Dearborn Heights. He attended Riverside High School and the University of Michigan. He excelled in athletics and academics. Bill was All-State in track and cross country. He graduated from the University of Michigan with degrees in architecture and engineering. As a distance runner at Michigan he was the 1977 Big Ten cross country champion, captain of the track team, and won multiple All American honors. Bill worked for Rockwell International and the Space Sciences Laboratory of the University of California, Berkeley, designing instruments and payload compartments for NASA satellites. 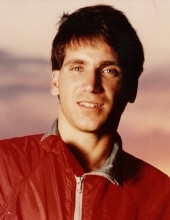 While immersed in his aerospace career, he continued running and was the US Marathon champ in 1986 (Twin Cities Marathon, 2:10:41). Bill also invented a hubless caster and a linear actuator, for which he received utility patents in the US and China. Through his many accomplishments, Bill was always a humble gentleman who was gracious to all. Brother of Timothy, Margaret, Mark, Gerard, and Donna. Preceded in death by parents (William and Jane). Visitation Potere-Modetz Funeral Home, 339 Walnut Blvd, Rochester, Michigan, on Friday, October 20th 2-8 PM (Scripture service at 7 PM). Funeral Mass at St Andrew's Catholic Church, 1400 Inglewood Ave, Rochester, Michigan, Saturday, October 21st, Noon (Instate at 11:30 AM). Interment St. Patrick Calvary Cemetery, Brighton, Michigan. Donations preferred to St. Andrew's Homebound Ministry. Instate begins at 11:30 a.m.
Brighton Lake Rd & Adams St.
"Email Address" would like to share the life celebration of William "Bill" Jan Donakowski. Click on the "link" to go to share a favorite memory or leave a condolence message for the family.